Well, if there’s one thing I’ve learned in China, is nothing really goes as planned. Everything’s flexible…Deadlines are more like guidelines, and a meeting can start thirty minutes late and still be socially acceptable. China likes to be fashionably late…But I guess that’s no excuse for not posting for a month. So I’m very sorry for keeping you all waiting, but this will be my comprehensive China blog with the highlights of my last month or so. 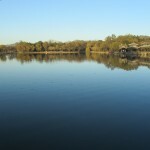 Thank you so much for reading my blogs, and I can’t wait to be back home to see everyone! Today was one of the more fun days. Lots of moving, lots of stress, and lots of high strung-ness. Crossing the border from Hong Kong to China wasn’t as eciting as I thought. I was expecting spotlights, red guards, massive security and overall China-ness. 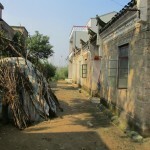 Instead, we crossed a barbed wire fence and we were in the PRC. Kinda unexciting…Kinda reminded me of the US-Canada border. In Guangzhou I definitely felt like I was in China. It actually seemed cleaner and friendlier than Taipei, and less English friendly than Hong Kong. As Americans, we definitely cause more excitement here. Norm lecturing at the foot of a monument results in Chinese people inching over, listening in, taking pictures of us, and taking pictures with us. I have been asked more about what I’m doing here in one day than I have in all of my days in Japan, Taiwan, and Hong Kong. In Japan they’re too shy, in Taipei they can’t communicate ad in Hong Kong they just don’t care, but in China they’re curious and outgoing. Its funny now, but after awhile I could see myself getting tired of the attention and answering the same questions with gestures and broken in English. (A month later, I can tell you that indeed I am tired of being a spectacle!) We saw the Swan Hotel and the area around it, which is the British Concession. After the Opium War in the mid 1800’s, China gave this area to the British government, and you can definitely tell. The area looked like the French Quarter in New Orleans as opposed to anything Asian…The European architecture definitely gave the former concession area a distinct feel. 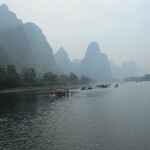 Upon arrival in Guilin, we saw some pretty eerily cool sights coming into the city. The Karst peaks loomed in the distance, some just barely visible in the dark behind the skyline. Guilin is mainly a tourist city of 700,000 residents, with the Karst geologic formations and the river boat cruise (which we’ll go on later) as the main attraction. We left the hotel after a lot of logistical bumblings for a late dinner. We found our way to what I think was a night market, and we couldn’t pass up the restaurant advertising Mexican burritos. We didn’t have much of a language barrier because of the English menu, but I can definitely see it being an issue once we’re out of this touristy area (it will be). But I’m already very excited about China, and it should be an interesting four weeks! 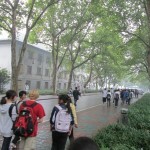 Today we went as a group to CCNU-Central Chinese Normal University. Augie tends to send many students here post-graduation to teach English to Chinese students. Upon arrival, we split up into groups and went into classrooms that were waiting for us. I was overwhelmed as we walked down the hall, students in other classrooms were shouting at us, begging for us to come into their rooms. It was crazy. As we walked into our classroom, I was further confused by the gender makeup of the class- thirty or so girls and three guys. I would later learn that there are 320ish female English majors and less than 40 guys. Nice odds, except that most o the guys don’t want to start dating until they’re 22 years old or so, at least the socially awkward ones I met. This must be a result of the one child policy, where people are encouraged to marry later and have fewer kids. I was taken out to lunch by four Chinese girls, and I definitely felt like a rock star. Two of them were very bubbly and talkative, and very good hostesses-better than most Americans. For our meal, they bought me any possible thing I could want, after realizing that I was too shy to ask for anything. I swalled down my tofu, veggies, and mystery black leaf-like food (turns out its a black fungus) because Cherry told me she’d be insulted if I didn’t. Jenny laughed at me as I used my chopsticks (I thought I had gotten pretty darn good), while Jade and June sat to the side, just kind of awkwardly staring at “their first foreign friend.” We later met Kevin, who was a little attention hog as it turned out. He wanted to look through my bagm read my textbook, help him study English, and be in every single picture I took. Every single one. We did have interesting conversations on the One Child Policy…Turns out most of the kids completely hate it and feel comfortable sharing their disdain. CCNU’s campus was beautiful. If it wasn’t for the 30,000 Chinese students going about their lives, you’d think that we were on Augie’s campus….The road right outside the cafeteria and library reminded me so much of 7th Avenue…I miss it! 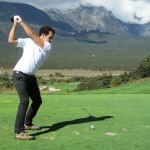 Jade Dragon Snow Mountain Golf Club! Today I golfed in China, the Himalayas, and the longest course in the world. The experience was amazing. A fellow Augie golf team member and I played as a twosome and had a blast. My caddie, Sam, spoke a little English, just enough to have fun communicating with him. He golfs too, and was quick to laugh at us (with my lead) when we screwed up (which was frequent). Upon finishing and getting back to the clubhouse (after pushing our cart up a hill and dying from oxygen deprivation at 10,000 feet) we were met by the manager of the club. He sat down and had a drink with us, and we learned a lot about the course and the Chinese golf industry. They’re pumping a lot of money into the complex, building another 18 holes and an international hotel. Most customers are Chinese, but he spoke English and Japanese too. The caddies have a good job; these eighteen to twenty one year olds get insurance, benefits, and a regular salary. Unlike caddy programs in the US, there were more women than men. According to the manager, these women have taken to caddying to bide the time until they marry. Its no longer acceptable because of the One Child Policy to marry young…I guess you can’t really escape hearing about the One Child Policy, even on a golf course. After getting back, I got back and crashed. I’ve never been at altitude before, and it really took a lot out of me. I eventually stumbled out of bed for dinner, and I went with a small group of kids and Marsha toa local restaurant for dinner, where I had the local delicacy: yak. Believe it or not it was delicious. 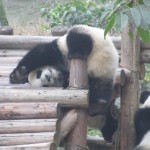 Today was our trip to the Panda Research Center. The hope was for us to get a better understanding of the conservation efforts taken by the center and the government to save the endangered pandas. People have such mistaken images of China as being less advanced, but the center in China is just as advanced and developed as anything we’d see in the west. 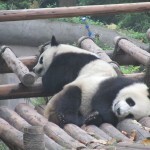 In the video we saw the difficulties the breeders face with the pandas…It turns out they’re often too lazy to mate. We probably learned a little too much about the artificial insemination methods of the scientists…But oh well. I was also impressed with the care the pandas recieved. The habitats were huge, with plenty of places to eat and sleep. I was worried the experience would be depressing like a Chinese pet shop…So I was pleasantly surprised. Thecoolest thing I got out of the trip had nothing to do with pandas. There was an Augie grad who was unable to make it who was an Asian Studies/Zoology major. She was a director of sorts at the institute. Granted, I have no biology background, but the experience really showed me there are countless options in Asia for work…If I wanted to, I could always get a job here. They were even giving out applications for internships at the institute…Definitely makes me feel better about my Asian Studies degree! Today after class we went to the Terra Cotta Army. 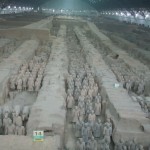 They were made over 2000 years ago by Qin Shi Huang Di, an ancient Chinese emperor. The day was rainy and overcast, but the soliders were indoors. What shocked me here was the apparent lack of care taken with the artificats. We walked into a giant covered but semi open-air warehouse with a giant pit in the middle. There, the unearthing process was underway, combined with the reassembly process of the shattered pieces. 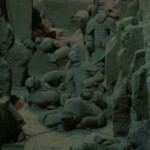 After over thirty years since its discovery, they aren’t even halfway done excavating the soliders. Not only the efficiency (or lack thereof), but the care taken in protecting the “Eight World Wonder” was unsettling. 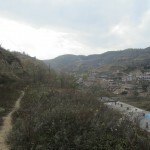 The artifacts were both exposed to the outside China air and the soliders were unprotected from the tourists; plastic water bottles were dropped and rolled into the excavation site. The whole “no flash” thing wasn’t really enforced either. I really hope China takes its history more seriously…If this continues the country might lose the most significant archeological discovery of this century. After Terra Cotta, we went on a quest for America. Un-Chinese food was the ultimate goal, and we succeeded with a three course meal: Subway, Baskin Robbins, and Starbucks. We were definitely feeling a little homesick. What we’ve been calling “America” has gotten me thinking about how ridiculous our notion of “Chinatown” is. Eggrolls, crab rangoon, and fortune cookies aren’t really Chinese, but that’s what 99% of all Americans think of when they hear China. Even if parts of Chinatowns are legitimate, they couldn’t possibly represent all of China with a little corner of a city. Similarly, “America” is more than Pizza Hut, KFC, Mickey D’s, Subway, Dunkin Donuts, Baskin Robbins, DQ, and Starbucks. But that’s “Americantown” in China. Really puts Chinatown into perspective, at least for me. 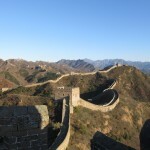 We spent today traveling from Chengde to Beijing, but we made a pretty significant stop…The Great Wall of China. After basically scaling a mountain, we made it to the wall. I quickly branched off from the group and headed towards the part of the wall that hadn’t been restored. The history major in me wanted something more authentic I guess, because the stretch of the wall we started on was restored for an IMAX movie. Anyways, we eventually made it to the more…rustic area, which had been built in the Ming Dynasty in the late 1300’s or early 1400’s. The wall had still been restored, but it was still falling apart in some places and overgrown in others. We hiked for about two hours before we had to go, but I definitely could have spent a whole day there. I’m sitting here in Beijing now, not studying for my last final. 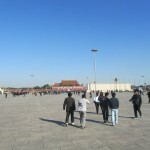 On our one organized field trip here, we went to Tiananmen Square and the Forbidden City. Tiananmen is one of the largest public squares in the world, and you could really tell the security is everywhere after the indicent in 1989. 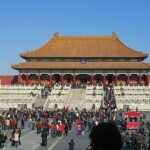 The Forbidden City too was a cool site, but has been become yet another touristy historical site in China. One of my favorite experiences here has been the Pearl Market, which actually doesn’t sell pearls. The building is two floors of fake designer goods and electronics being hawked by very aggressive Chinese salespeople. I haven’t talked at all about bartering in China, but it has been a huge part of our lives the past few weeks. In China, you bargain for everything, from t-shirts to electronics to liquor. “Cheaper for you!” “No joke price!” and “You crazy!” are a few of our favorite bartering phrases. Markets like the Pearl specialize in fake purses, backpacks, jeans, and even computers and iPhones. I’d be lying if I said I didn’t take the opportunity to buy a pair of Pumas…our four….for $10 each! 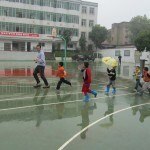 We stopped at a grade school in Wuhan, where the kids played chase the giant.